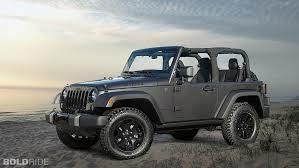 Earlier this week, Jeep rattled the automotive world by announcing that they are considering going green. GREEN???? Tree hugging, climate control thumping green??????? In an interview with Auto Express, Jeep boss Mike Manley said that he hopes to incorporate hybrid powertrains into future Jeeps, claiming that fuel economy is not their only motivation. Manley says, “With an electric motor you have the most torque available and with the right combination of transmission and gear ratios you can create incredible crawl ratios.” This is possible because conventional hybrids operate on electric power alone while at low speeds and gentle throttle usage. 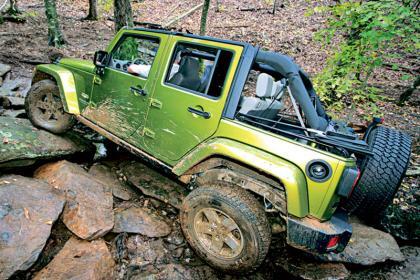 This, of course, makes it ideal for the slow, grinding off-road trails that Jeeps naturally churn through. One problem, though, is the fact that the electric battery packs in the powertrain would drain fairly quickly under the taxing circumstances, meaning that the actual hybrid option could only be used at certain points. The hybrid powertrain isn’t the only “green,” efficient option being pursued, either. Jeep is also considering a switch in their body design, hoping to use a mixture of aluminum, high-strength steel, and also carbon fiber. This entry was posted in Culture, Jeep, Off-Road News and tagged electric, green, hybrid, jeep, mike manley, powertrain. Bookmark the permalink.